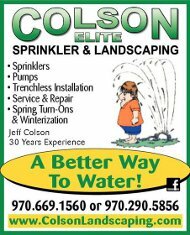 Current Specials – Colson Elite Sprinkler & Landscaping, Inc.
Any complete sprinkler system or landscaping project of $2,500 or more. Call (970) 669-1560 to Redeem. Minimum Original $60 Labor Charge. Good June Through September Only.